We've been on the road with the Tortuga Travel Backpack and the Osprey Farpoint 55 Travel Pack for over six months now. We've each had a chance to pack in and carry both bags. We've carried them - fully loaded - over cobble stoned European streets and up mountains in the Peruvian Andes. We've chucked them in cabs and buses, stuffed them in overhead bins and bus station lockers. They've been with us on $10,000 business class flights and $12 overnight international bus trips. So which bag is best? Which bag should you take on your trip around the world? 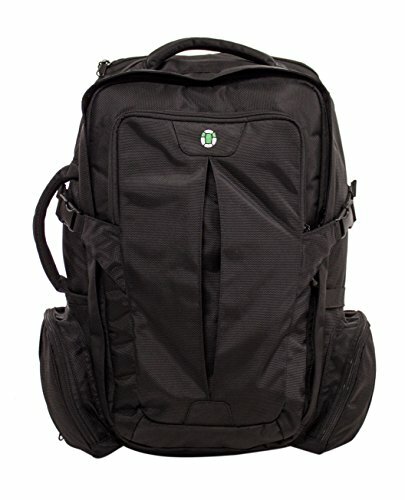 The Tortuga has a 44L capacity including its main pocket and front pocket. The Farpoint 55 has a 55L capacity but only when the daypack is included. Without the daypack attached, the main bag on the Farpoint holds only 40L. The Farpoint 55 on the left has 40L of capacity without its daypack vs the Tortuga Travel Backpack's 44L. You can see above that much of that space comes from the Tortuga's expandable front pocket. The Tortuga is also a bit wider and more boxy. So when you think about capacity you have to ask yourself: how often will I attach the daypack to the main bag? In our experience, not much. For us, this is partially to do with the manner in which we travel and partially to do with accessibility and packing dynamics. You can see here my daypack over my right shoulder and Jess' clipped into the straps for her main bag. We seldom spend a significant period of time walking. Instead, we are often walking short distances (from accommodations to transport or vice versa) and then putting our bags down or checking/storing them. When we are separated from our bags (either in an overhead bin or beneath a bus) we typically want a selection of vital and/or convenient items to stay with us. That includes things like our laptops, daily used chargers, passports etc. We both like using these items on long bus rides or plane trips and also want to be left with essential items should a bag get stolen. Since we are inevitably going to want to separate out those items at some point in each travel day, it seldom makes sense to attach the daypack for the short time we are walking. You can see here that a fully packed and attached daypack extends out from Jess' back a decent distance. There's a reason that most hiking backpacks have a tower shape, preferring to go up instead of out. By piling the weight up you make it easier to put the weight on the waist belt and reduce strain on the lower back. In addition because the daypack attaches to what is essentially the far side of the pack from your back, it doesn’t make sense to put anything heavy in the daypack if you are planning to attach it to the main bag as this puts uncomfortable pressure on your shoulders and upper back. So attaching the daypack means packing vital and commonly used items like laptops and chargers deep in the main pack, which is inconvenient on a normal travel day. In some ways concerns about whether or not you will attach the daypack are arbitrary because whether we attach the daypack or not, we always have the daypack with us. However, most of what’s heavy you will want to put in your main, most comfortable pack, using the Farpoint 55 means that you have 40L of space for that most times, not 55L as they advertise. Bottom line, although the attachable daypack is a cool and seemingly useful feature, we seldom use it. If we were traveling on more of a budget or simply hiking much more, the feature might prove more useful. Since we functionally don’t attach the daypack very often, I would consider the Tortuga to win out in total capacity here. The Tortuga Travel Backpack is designed to make maximum use of the dimensions available for carry-on on most non-discount airlines. This bag will not meet carry-on requirements for Ryan Air, for example. The Tortuga really tries to take full advantage of the dimensions of your standard carry-on space by making their bag boxy with an overall rectangular shape. The Farpoint 55 has a shape and design much closer to a regular hiking back pack. The Tortuga comes in one color: black. The Farpoint 55 comes in red, black or blue. In terms of which bag is more attractive, it’s a bit of a tossup. The Tortuga looks a bit more modern perhaps and interesting but its just as likely that people would be put off by its boxy look. The Farpoint 55 has a more conventional backpack shape but might feel too hiker-ish for some travelers. Both packs are generally well balanced with solid wide shoulder straps, secure and comfortable waist belts and chest straps. Both are comfortable to wear for extended periods on even or uneven ground. Fully loaded our bags are typically about 10-12 kg (22-25 pounds). The Tortuga has what is – in my opinion – a bit too much padding on its straps and back. The Tortuga straps feel almost mushy with foam and mesh. Overall I prefer the stiffer and more substantial feel of the Farpoint 55’s straps with a lesser amount of meshed padding. While both bags hold their form empty or full, the Tortuga accomplishes that with its excessive padding and foam. The Farpoint has a minimal but effective metal frame that gives the bag structure. That slight center curve is the Farpoint's internal metal frame. It doesn't add much weight or bulk but really helps with moving weight to the hips and waist belt. This metal support also gives the Farpoint the overall advantage in comfort by making the bag stiffer through the back. This keeps the bag further off your middle back and helps shift weight to the waist belt to relieve fatigue on the back and shoulders. The curve of the Farpoint's metal frame displaces weight to the hips and keeps it off the lower back. It’s also a big deal that the Farpoint 55 comes in two sizes. I’m 6’1’’ and Jess is 5’10’’ so both bags fit us. For a shorter person however, the Tortuga could well be too long for their torso and make it a non-option. Tortuga makes a big point about their padded and comfortable waist belt and how necessary such a waist belt is to making a bag wearable for an extended period while fully loaded. This is true but the belt can’t really do its job if the structure and alignment of the bag doesn’t direct the weight to the belt. The Tortuga's lock of structure means the bag bulges in towards the back and pulls out from the upper back. This pushes into the lower back and puts more pressure on the shoulder straps. Instead of balancing on the waist belt, the bag tries to pull away from the body at a diagonal, from the waist up and away from the back. I don't want to overstate my point: Tortuga’s bag is comfortable and I’ve worn mine fully loaded for more than an entire day of pretty extreme hiking, but overall I think the Farpoint is a smarter and more comfortable structure for wearing. It’s close in this case but for heavier loads and significant amounts of hiking or walking, I would choose the Farpoint 55. The Farpoint 55 outsources most of its compartmentalization and extra packing pockets to the daypack so I can’t really discuss its packability without talking about the daypack. The daypack’s design is not my favorite. A number of poor design features seem like they had to be included in order to attach to the main pack. For instance, the shoulder straps each feature incredibly long additional strap length that hangs a foot or two beneath the bag unless you are conscientious about tucking it away. These extra strap lengths are part of attaching the bag to the main pack. The bag features a small, front pocket on the top of the bag that is convenient for wallets and phones, yet also worryingly available to pickpockets in crowded urban environments. The top pocket is there beneath the longer zippers of the main compartment. The pocket can't go much lower than the Osprey logo because of the attachment straps. The small pocket’s location seems to be due primarily due to the necessary placement of support straps for attaching to the main bag; it can’t extend too far down the bag because support straps have to wrap and support its attachment. If you can’t fit your item in the small pocket, your only other option is the large main pocket. Because the top small pocket is essentially sewn into the flap on the exterior directly beneath the zipper when the small pocket is full it hangs over into the space of the large pocket making access and visibility in the main pocket significantly worse. When you open the main compartment, the small top pocket hangs in the way, obscuring your view and complicating access. This is especially noticeable if you are trying to access the main pocket without putting the bag down as we frequently do while walking around. The depth and size of the main pocket – combined with the obstruction created by the smaller top pocket – make the storage and retrieval of medium sized items like tablets and water bottle difficult. Visibility is also made more difficult by the darkness of the interior fabric. That said, the daypack’s main pocket has pretty decent total capacity including a laptop sleeve with a securing clip and a small mesh pockets for miscellaneous items. The exterior has two small mesh pockets appropriate for small water bottles or sunblock. The lack of stretch in these pockets give them very limited usability. You won't fit a full size Nalgene bottle in there for instance. Perhaps most important, the design of the daypack and its attachment mean that the only pocket that is easily and readily accessible when the daypack is attached is the small top loading one. Here you can see the attachment support straps that attach directly under the smaller top pocket. To access the larger compartment on the daypack (for instance to retrieve your laptop or tablet) while it’s attached to the main pack requires loosening the main support attachment straps and then kind of wedging the pocket apart to get in there. It's difficult to access the main pocket on the daypack once you attach it to the main pack. The whole time, the smaller pocket hangs in the way making it hard to see and retrieve stuff. Again, this whole design scheme is why we so infrequently attach the daypack to the main bag. Compare this to the Tortuga which features five fully accessible pockets on its exterior when fully packed, not even including the dedicated laptop pocket with a zippered entry. The Tortuga has two pockets on its waist belt that are well designed and useful for smaller items like tickets, passports, keys or cables and small chargers. There is one of these pockets on each side of the waist belt. Their placement makes them accessible and safer from pickpockets. Since wearing a fully loaded pack with a waist belt can make accessing your pants pockets difficult, these pockets are a really nice feature. The next set of pockets are side pockets on the main pack that are appropriate for small items or water bottles. Though the zipper design and side seems look a little weird, it makes these side pockets surprisingly spacious. Since they are at the base and side of the main pack you can also put long and narrow items in these and use the side sinch straps to hold them in place. The final exterior pocket is the front pocket which has a nice wide opening and stitching that allows the bottom of the pocket to puff out to hold bulkier items or permit you to quickly stuff softer items like jackets or towels down into it. The only downside of all this accessibility is there being three zippers that you need to put locks on if you want to secure the bag for checking or storage. Inside, the Tortuga offers even more opportunities for compartmentalization and ease of packing. There are two sizeable and easy to access mesh zippered pockets and the flat pockets on the internal retension straps. In addition to the dedicated padded laptop sleeve, there are a pair of mesh pockets attached to the back of the main compartments flap (something the Farpoint 55 offers as well) as well a pair of elastic retension straps that hold packed items in place. Each of these straps also offers a small flat zippered pockets appropriate for small items like documents, lip balm, pills etc. The retension straps have limited usefulness if you use packing cubes which like we use (and which any long term traveler should), but are still a nice feature to have. In terms of external straps, the Farpoint 55 does offer a few more options including the external daypack retension strap (which can be repurposed when the daypack is not attached) and a few other straps near the base that could attach a camping mattress, rolled jacket, larger tri-pod etc. As primarily urban travellers, we have only used these straps once: on the Inca trail. Overall, the Tortuga is a slam dunk in terms of packability and accessibility compared to the Farpoint 55. It’s easier to use on the go thanks to it’s multiple external pockets and definitively better for those who travel with or need access to a laptop. Having used both bags for several months now, I should start by saying that we have had no problems of any kind with either bag. Despite numerous flights and bus trips, packing these close to bursting time and time again, there are no holes, no broken hardware or zippers. That said, I do have some judgments from comparing the look and feel of these two bags that have led me to different conclusions about their construction and long term durability. I’ve used several Osprey bags and had a uniformly positive experience with their construction and materials. The Farpoint 55 is no exception. It seems strongly made and stitched and has shown almost no signs of deterioration. The Tortuga on the other hand has a few minor issues that have not developed into larger problems, but that still worry me slightly. I also had a poor experience with Tortuga’s ultralight packable daypack that has influenced my concerns about their fabrication. The first Tortuga I received when I ordered it had an exposed seem on the front pocket exterior that was fraying when the bag arrived. Tortuga’s customer service was excellent and sent me a new bag (the one I have now) even before I returned the other one. However, the new bag has a minor version of the same issue in the same spot. You can see the loose seem and threads emerging just past the curve of the zipper. There’s a similar seem issue at the base of the front exterior pocket where the internal stitching is visible on the exterior. Over six months of rigorous use the exposed seem hasn’t degraded, but I can’t say the same of the Tortuga daypack I switched out in the first two months of the trip. Though other issues led me to discard it, the Tortuga daypack developed a hole in the exterior at an important seem within the first two weeks of use. The Tortuga logo also peeled off like a cheap t-shirt decal prior to even washing the bag. My guess is that as a small retailer they have serious limitations on the quality of fabricators they can attract for small runs of product which results in less than perfect construction. This idea inspires worry in me about things like the construction of the straps which connect to the rear top of the pack with a single seem and no supporting straps. Compared to the stiff, tight stitching of the Farpoint 55’s straps and their accompanying support and adjustment straps, the Tortuga’s straps connection to the main pack seems worryingly minimal. Double stitched straps with adjustable support straps. I think you can see it in other aspects of the bag as well. For instance, the plastic hardware that supports the chest strap is narrower than the strap its connected to. When you wear a loaded pack the strap running through the hardware sinches and compacts the strap. This scrunching doesn't affect comfort but makes me worry about longevity. It’s clear they are using someone else’s hardware on a wider than average strap. The zippers are another example. Though they are YKK they are smaller toothed and less durable than those on Jess’ Farpoint. Less so with the Farpoint. Overall, given my experience with both companies products and the look and feel of each pack, I have a higher degree of certainty that the Farpoint 55 will last. Tortuga has highly superior customer service but that feature doesn’t help me much while on the road. If a strap rips off, I won’t have the time or money to ship it back for repairs. I will simply have to discard it and buy a new bag. At $180 for the Farpoint 55 and $250 for the Tortuga, neither pack is cheap. Of course, if you are trying to pack minimally for a long trip, your bag isn’t somewhere you want to cut corners. You are going to want a daypack and the Farpoint includes one for a smaller price than the Tortuga. However, if you already have a daypack, I don’t think the one included with the Farpoint 55 is very good. I also think the packs each function best for a slightly different type of traveler, so the difference in price for me really isn’t a clear cut advantage for the Farpoint. Tortuga advertises itself as the backpack for the urban traveler and I think it does exactly that. While it has its issues with structure and construction, I think it’s the better option for the type of traveling we do. While we aren’t always in cities, we seldomly are hiking for long periods of time or camping. If you are someone who travels with and uses a laptop everyday then the Tortuga will serve you better than the Farpoint 55. It’s better organized and easier to pack. Though it costs more than the Farpoint, I think it’s worth it. For those more intent on going off the beaten path, the Farpoint is probably a superior option. If you are going to need to wear a fully loaded pack for hours at a time or hike significant distances, it’s a better option. It supports its own weight better, has more durable construction and an overall larger capacity, even if it’s organization is lacking. If you're interested in purchasing the Tortuga Travel Backpack you can get it on Amazon here. 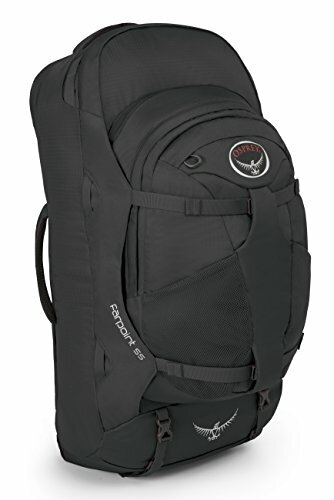 If you are interested in purchasing the Osprey Farpoint 55 Travel Backpack you can get it on Amazon here.